Is it the same for you? Fall is very late this year although it is cooling down where I am. 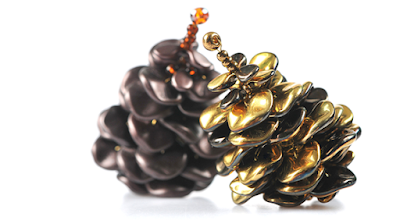 Here is a Preciosa-Ornela tutorial on how to make a pine cone bead and wire fall ornament. These are constructed with 28 G (0.3 mm) wire Preciosa ripple and pip beads. Florist tape helps keep the bundle of twisted wire ends tidy. You can make several of these to decorate a fall wreath! If this sounds like a good idea, I wouldn't cut off the taped up as short as in the tutorial. Leave it longer so you can attach the pine cones to your wreath. These would make great earrings for the Christmas season!